Over a red sky, the sun sets paints the cars ahead of me as muted silhouettes. The median’s green trimmed grass has lost its brightness in comparison to its pavement cell walls, and the tall untamed trees beyond the shoulders have darkened under the pressure of brilliantly illuminated jet streams. Across the way, cars and trucks speed eastward, away from the sun, discernible only by pairs of shining headlights affixed to their hoods. I love how I feel; my windows are down and my music is up. This is the life. It takes some time, but I’m eventually able to move from the highway and onto the slower streets of the town my Grandparents live in. Only a lane wide in each direction, the main street divides the small town into two halves, allowing only a few crossroads to intersect it. Because of this, your choices are limited as you drive into the heart of the small town as the row of historic brick buildings on your right and the perfectly coiffed park on your left offer little more than a hardware and a place to relax. But in recent years, the town has changed. Each time my mom drives down the main street, you can see her making comparisons between what is now and what is remembered. There are stoplights now, and more grocery stores than ever before. There’s even a Wendy’s and Mcdonald’s. This isn’t really a small town anymore. But I still love it, and I will for as long as I can stand the traffic. I mean, really, even though there are two stoplights in town (WOAH! ), they’re spaced far enough apart that you’ve forgotten the first when you’ve reached the second. There aren’t hundreds of cars on the road, blocking your way and cutting you off, and I’ve never once muttered profanity under my breath while making my way to my Grandparent’s house. But I can’t, unfortunately, say the same for driving in big cities. Don’t get me wrong – I love big cities, but I’m a small town girl. I can’t handle the cars. I almost cried while driving in Toronto last year, and even driving through Cincinatti scared me. Since the same can be said for mom, we’ve made a habit of nominating my step-dad as our chauffeur when we take road trips. But he’s not going to New York with Mom and I this weekend, which is why she and I will be taking a cab to the studios of The Martha Stewart Show on Tuesday the 20th. Why? Because I’ve been invited on the show to do a segment about the process of making this cake for the colors show. HOW AMAZING IS THAT? I haven’t been able to concentrate in class for days!!! I never imagined that this blog would ever be more than my creative outlet… Who could have guessed that it would land me in New York? With Martha Stewart?!?! Be sure to tune in if you want to see how the Super Epic Rainbow Cake is done! Whisk the eggs, egg yolks, vanilla, salt and sugar together in a large bowl over a pan of simmering water. Whisk gently until the mixture is just lukewarm, about 100F on a candy thermometer(or test with your finger – it should be warm to the touch). Add one-third of the flour mixture to the beaten egg mixture. Use a rubber spatula to fold in the flour mixture, making sure to scrape all the way to the bottom of the bowl to prevent the flour mixture from making lumps. Repeat with another third of the flour mixture and finally with the remainder. Pour the batter into the prepared pan and smooth the top with an offset spatula. Bake the genoise for about 10 to 12 minutes. Make sure the cake does not over bake and become too dry or it will not roll properly. Let cool on a rack. 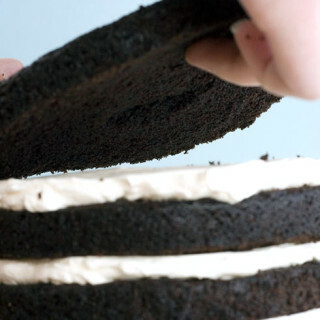 Remove the cake from the baking sheet and invert it on a larger piece of parchment paper. Peel of the parchment paper that was lining the baking sheet. Set the cake aside. Same process but replace the amount of cornstarch with the same amount of cocoa powder and proceed with the recipe the same way. In a small bowl, sprinkle the gelatin over the water and let stand to soften while you prepare the cream. In a large bowl, whisk the egg yolks with the sugar until very pale. In the meantime, in a medium large saucepan set over medium heat, bring the coconut milk to a simmer. Slowly pour the milk over the yolks, whisking constantly to prevent them from curdling. Pour the mixture back into the saucepan over medium low heat and cook until the cream coats the back of a spoon (as if making creme anglaise). Add the softened gelatin and stir until melted completely into the cream. Let cool to room temperature. 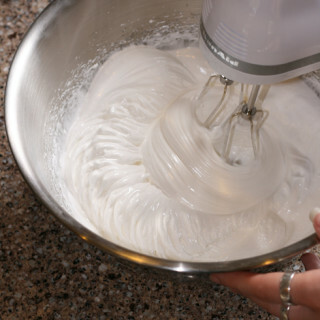 In a stand mixer fitted with the whisk attachment, whip the cream to soft peaks on medium speed and fold it into the cooled cream base. Use within one hour. In a small bowl, sprinkle the gelatin over the water and let it soften while you prepare the fruit. In a medium saucepan, bring the mango puree and sugar to a simmer. Remove from the heat and add the softened gelatin. Stir until the gelatin is completely melted. Transfer the fruit puree to a large bowl and let it cool to room temperature. 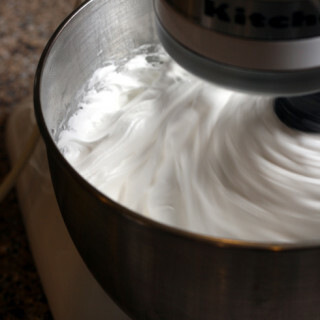 In a stand mixer fitted with the whisk attachment, whip the cream on medium speed until soft peaks form. Fold about 1/3 of the whipped cream into the fruit puree to lighten it up (do not worry about losing air at this point). Carefully fold in the rest of the whipped cream. Use within one hour. In a small saucepan set over medium high heat, bring all the ingredients to a simmer until the sugar dissolves, stirring occasionally. Let cool to room temperature. In a small bowl, sprinkle the gelatin over the water and let it soften. In small saucepan set over medium high heat, bring the water, lemon juice and sugar to a simmer, stirring off and on to make sure the sugar dissolves properly. Add the gelatin and stir until completely dissolved. Let cool to room temperature (if the mixture gels, warm up over low heat until barely melted again). Line an 8×8 baking pan with parchment paper of foil, leaving a border on the sides to make it easy to remove when set. You can also use a cake frame of the same dimensions. 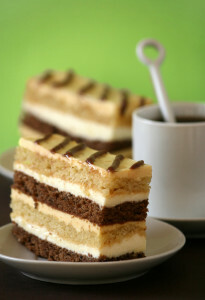 Cut two 8×8 cake layers in each of the genoises. 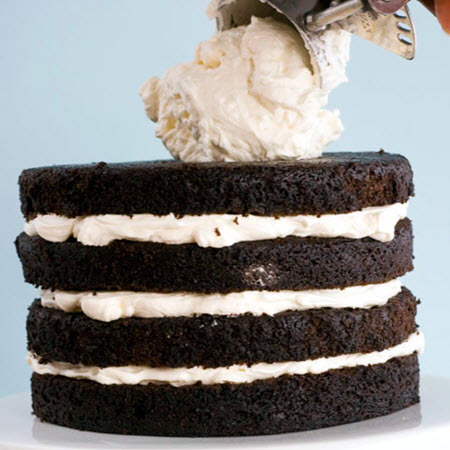 Place one layer of the chocolate genoise at the bottom of your pan and brush with some rum syrup. 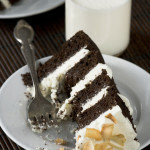 Pour half the coconut Bavarian on top and smooth with an offset spatula. 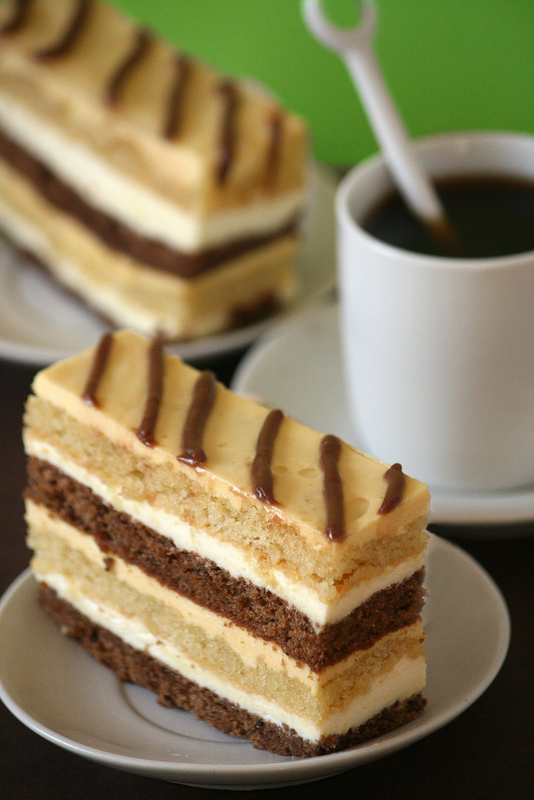 Top with a layer of vanilla genoise, brush some rum syrup on top. Pour half the mango mousse and smooth with an offset spatula. 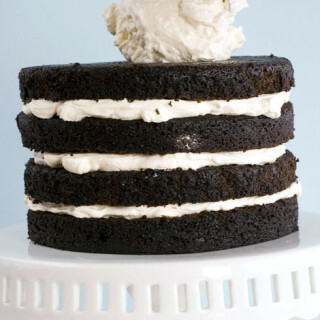 Repeat the process with the second half of cakes and creams. Refrigerate until set. Pour the lemon glaze over the cake and let set in the fridge. 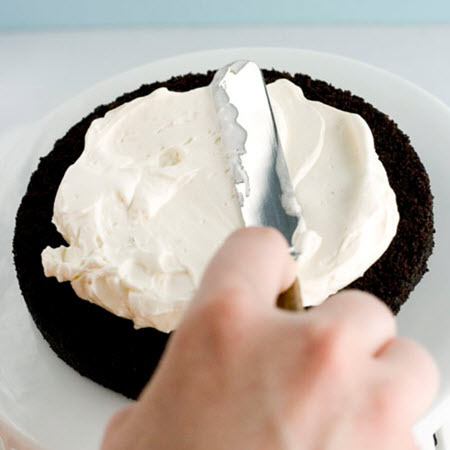 Cut through the cake with a knife dipped in hot water to prevent breaking the glaze instead of slicing through it. That is so awesome. I&#39;ll make sure to watch! Well done! Way to go 🙂 Good luck. That is absolutely amazing! Congrats! JEALOUS!!!! I watch her show every day. I&#39;ll see you on there! Congratulations on being in vited to Martha&#39;s show, rad!!!! And this cake looks amazing, perfect for a celebration. that&#39;s awesome!! congratulations! i love that cake! amazing! I am from Paris (now in Rome) and I discovered your blog thru your rainbow cake. I am so happy for you and really excited that your talents will be featured on tv. I hope to be able to find the segment online somehow, since I do not get that show here. Again, congratulations! 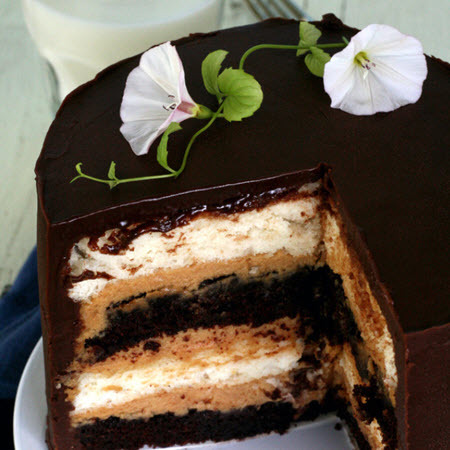 Oh Lord, this looks marvelous!!! SO BEAUTIFUL!! I love the tone on tone thing you have going. Absolutely divine!! OMG! Congrats! It&#39;s definitely well deserved! Congratulations! Your rainbow cake is also what got me started reading your blog. A friend of mine made one based on your recipe and then I followed suit. What an exciting experience for you! Have fun! Oh wow, congratulations!! Very very excited for you 🙂 I wish we got her show here. Maybe the segment will make it&#39;s way onto youtube. <br /><br />This celebratory cake looks so delicious and moist, by the way. Congratulations! That is so cool. You will be great. Not sure when that episode will air in Australia but maybe I can see it on the net. That cake looks amazing. I will make it soon, I&#39;m sure. Great job! That is so exciting! I&#39;m so happy for you–congrats, girl! I don&#39;t watch TV (and don&#39;t have cable) so I hope you&#39;ll post the clip with you in it later on if you are able to. I want to see it! Congrats and well done!<br /><br />Hopefully I can watch online here in Australia! That&#39;s amazing! Congratulations! 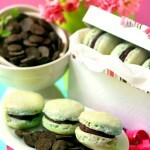 Although, I&#39;m not surprised, your photos themselves look good enough to eat! Wow amazing, heard about you thru @citrusandcandy on twitter, Congratulations @carmr Carm from Sydney Australia. What a GOOD THING!! Can&#39;t wait to watch you. Have Fun!!! Wow, that is great! I wish I was that successful with my passions and hobbies in life! I am thrilled for you! The cake is gorgeous and good for you. Martha is wonderful and smart to have you. Good luck and have fun. Have a great time! We&#39;ll all be cheering for you! Wow… congrats, that&#39;s really lovely, the cake looks amazing. oh my freakin gosh that&#39;s fantastic!!! 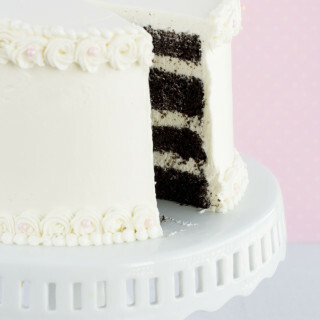 That rainbow cake was the cake that led me to your blog! Can&#39;t wait to see how the segment comes out. Going to set the dvr right now.. CONGRATULATIONS!!!!!!!!!! <br /><br />This cake looks lovely. It has a lot of components, but I bet it was worth the work. Oh my gosh…you are FAMOUS!!!! SO fantastic! I hope Martha is not jealous of you and your awesomeness. Maybe you can teach her to lighten up a little.<br /><br />And that cake? um….yummy!! OH MY WORD!!!!!!!!!! I am SO happy for you!!! When I saw this cake on your blog, I made it for my son&#39;s 2nd birthday. It was a TOTAL hit! What a great opportunity for you, so excited!!!!! Good luck! Congratulations! :DD<br /><br />Will you be able to post the video here later? I live in Sweden, and I don&#39;t know when it&#39;s going to air here..
Just posted on this at http://www.capabilitymom.com <br />Congrats again! 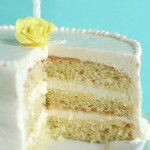 Congrats on getting on Martha!<br />The mango and coconut cream cake looks so amazing! Look at all those clean layers.. Very cute! WoOoW! so cool and so special! There aren&#39;t too many people growing up in the U.S. that can add that experience to their list! !<br />Congratulations Kaitlin, you&#39;re a very talented young lady, for sure. 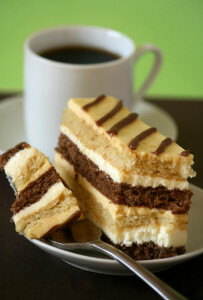 I had a piece of cake for lunch today. It was very good! So proud of you Kaitlin! what an incredible dessert….I am just blown away!! and your photography is exceptional<br />Best of luck on Martha!! Congratulations! That is so amazing. I can&#39;t wait to see your Rainbow Cake segment. Good luck. Congratulations! Though you shouldn&#39;t be too surprised, everything on here looks absolutely divine! Congratulations. I smell a book deal!<br /><br />You deserve it! Congrats! YOu will knock Martha right outta her socks – she&#39;s got nothing on you! :)<br /><br />That&#39;s pretty awesome, I&#39;m sure you will do wonderfully. Holy crow! That&#39;s amazing!<br />I think I first found your blog through Luisa&#39;s links on Wednesday Chef… I am continually impressed, and no doubt Martha&#39;s viewers will be too! Woo hoo! Congrats on the Martha Stewart thing – how incredibly exciting for you!! You&#39;ve got a great blog going on here, I&#39;m sure everyone will love you on the Martha show!! How incredible! Have a great time. That is SOOO amazing and I am so beyond excited for you! Have the best time in New York! It&#39;s where I live and it really is the best city! Let me know if you need any help navigating the city or have any questions at all! Have SO MUCH FUN!!! Oh my gosh – this is so exciting for you! Congrats and I can&#39;t wait to watch 🙂 Off to set my DVR. I just watched your segment on Martha. You did a great job. I&#39;ll be checking out your blog. The recipes look wonderful. I just watched your debut on tv and thoroughly enjoyed it! 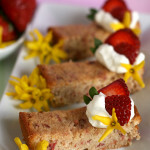 I love baking and was so glad Martha shared your blog name, because I most definitely added you to my list of favorites! I am SO excited for you… I would just die if I even knew Martha LOOKED at my blog, much less had me on a show…you ROCK! I can&#39;t wait to try some of your recipes!!! Just discovered you and your blog from watching Martha Stewart today. I can&#39;t wait to find an occasion to make the super awesome rainbow cake! Hi,<br /><br />I&#39;m watching you on the Martha Stewart Show as I type this and just wanted to drop by and tell you you&#39;re doing great! What an awesome chance. Your cake is beautiful. Good luck with everything! Congrats! That cake is gorgeous!!!! You were great! Martha should snap you up! oh my word, i just found your blog (via your comment on my billy&#39;s cupcake post) but congratulations! that cake is gorgeous indeed. i&#39;ll youtube it or find the segment! Congrats! the cake looks wonderful!